92Pts-WS - Beguiling nose of ripe, dark berries and spicy fruitcake with some cedary cigarbox highlights. Rich and ripe in the mouth yet displaying elegance and refinement. Beguiling nose of ripe, dark berries and spicy fruitcake with some cedary cigarbox highlights. Rich and ripe in the mouth yet displaying elegance and refinement, the same spicy fruitcake and cedar flavours mingle with a deeper, forest floor and cocoa powder note. Good firm frame of oak and ripe tannin but wood doesn’t dominate the fruit. Gentle floral lilt at the tail end of a long aftertaste. Balanced throughout. Grapes are picked by hand, placed into small lug boxes and transported to the cellar in a cool truck. In the cellar, the whole berries are manually double-sorted and then gravity-fed into fermentors. Each batch is cold soaked for a few days and then slowly brought up in temperature. Malolactic fermentation occurred naturally in the barrel. The wines were aged for 18 to 24 months in 225ℓ new French oak barrels, bottled unfiltered and bottle aged for a year. 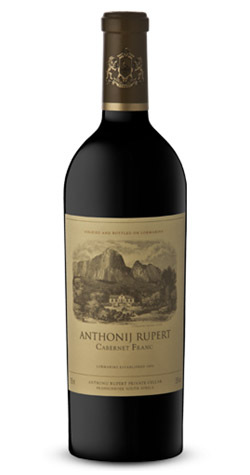 The Anthonij Rupert Wyne vision is made up of a number of facets, best illustrated by their 5 wine brands which each contribute to the overall goal. These brands unite to form a mighty vision of quality, innovation and south african heritage, something that is replicated in all aspects of Anthonij Rupert Wyne.